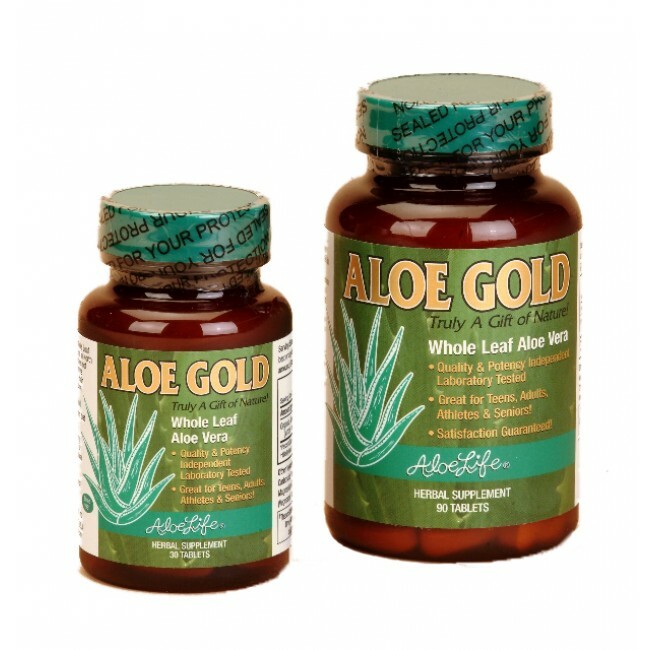 Aloe Gold 30 Tablets are made from Certified Organically grown Whole Leaf Aloe Vera leaves and 3rd party tested to be the highest quality tableted Aloe Vera tablet. 3 tablets equal 1oz of WL Aloe Vera Juice Concentrate, Great for Travel, Gluten and Preservative free. Aloe Gold 30 Tablets are made from Certified Organically grown Whole Leaf Aloe Vera leaves harvested from rich volcanic soils in North America and considered to be the highest quality tableted Aloe. Processed to protect important actives through a unique low temperature dehydration method, not spray dried into a matrix of sugar like many products. Over 100 active constituents have been isolated from Aloe Vera in trace amounts including higher levels of polysaccharides. Independent 3rd party testing found Aloe Gold tablets to be the highest in these important and delicate polysaccaride chains that provide maximum immune system support. Aloe Gold tablets are not over filtered or over heated therefore is abundant in actives including the valuable yellow sap, saponins, sterols, and the long chain Glyco-nutrient polysaccharides - tested to be in the therapeutic range of 450,000 Dalton size (microscopic chains) - research indicates are required to support body wellness. The distinct Herbal Bitter Taste - Test (bite into a tablet) proves the products superiority. Herbal Bitters may be responsible for gastric flow improving digestion and for occasional relief from indigestion gas and bloating. Contains No Preservatives or Gelatin from capsules that can be irritating for bowell distress and IBS. Great for traveling or busy people! Many people take the tablets before meals as a natural digestive aid as one may take an enzyme supplement.The tablets are formulated with Calcium Citrate and Magnesium Citrate providing beneficial minerals in their highly absorbable forms. Three tablets equal one ounce of Whole Leaf Juice Concentrate. Use caution if diarrhea. Look and feel your best with daily Aloe Gold Juice or Tablets!